We were asked by the Serpentine Gallery to undertake the installation of a water sculpture by the celebrated French artist, Bertrand Lavier. Lavier is renowned for his tongue-in-cheek attitude and his use of relatively banal, everyday objects in creating his artworks. 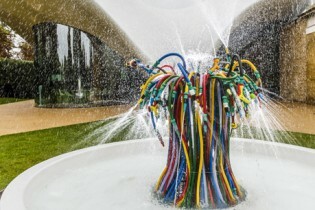 Formed from numerous brightly coloured hosepipes, Lavier’s water sculpture is a playful take on the formal fountain. 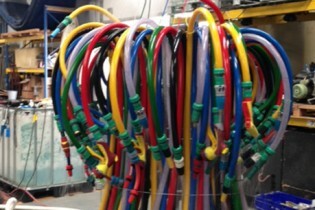 Jets of water spray from multiple colourful hosepipes which are clustered together over a GRP pond. Working to Lavier’s designs, our crew undertook the complete installation, from groundworks, fitting the necessary water and power supplies and water filtration system, as well as sourcing and fitting all hosepipe components. Our workshops manufactured the GRP pond while we worked with Water Sculptures to refine the fountain’s performance. Installed to coincide with London’s contemporary art fair, Frieze, the fountain is located in the grounds of the Sackler Gallery, adjacent to the new Zaha Hadid designed extension, where it forms part of the Serpentine’s ongoing programme of commissioning outdoor works. It will remain in situ for one year.